Danby - DDR70A2GP : Dehumidifier Review • The Air Geeks, reviews of air conditioners, dehumidifiers and air purifiers. 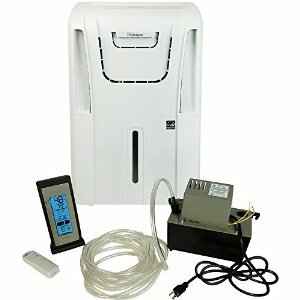 Many households now are purchasing dehumidifiers to maintain clean and safe indoor air. Formation of molds and mildew, which could be the leading causes of diseases such as asthma and allergies, are caused by moisture. The Canadian brand presents its very efficient new model, the DDR70A2GP, and one can’t help but notice the efficiency, the sturdiness and the reliability of the unit. Our review. The Danby DDR70A2GP is a very well-built, professional looking unit that comes equipped with a few extra features that makes it highly recommended. It also comes with a two-year warranty instead of the industry standard one year warranty, which is worth its weight in gold and also an additional 6 months warranty on plastic parts. This dehumidifier’s great asset is the outstanding warranty which is recommended to any potential buyer that values warranty coverage as a top priority when making his/her purchase… as we think they should! The Danby DDR70A2GP is designed to remove up to 70 pints of moisture every 24 hours from large areas up to 3,800 square feet. In real life, at room temperature, one can count on ~30-40 pints saved in a day. It will result in lower electricity bills and since the unit is Energy Star compliant – you’ll save more money down the road. The measured power usage at approximately 50% RH is 590 watts. In an extreme high humidity setting such as above 90% RH, its power usage measures 750 watts. Unfortunately, when it comes to the noise output, this dehumidifier is moving a lot more air compared to most of its 70 pint competition and it might be too noisy for some customers willing to buy this unit. he noise is due to the unit’s moisture removal at a much greater rate. This unit has no continuous mode and no auto mode. It just runs continuously until it’s turned off. There is a low and high fan speed, an automatic restart feature and an auto de-icing system. One of the extra features the unit comes with is a separate LED display that show the ambient air temperature. The unit is a breeze to operate thanks to a number of electronic controls which let you fine-tune the settings to the needs of your home. It also has a defrost mode which can be activated every time frost accumulates on the unit’s evaporator coils. When activated, the dehumidifier’s compressor will shut off and the fans will continue to run to melt the frost on the coils. Despite these features, Danby doesn’t have a check filter light, an element which alerts you when you need to remove the filter and clean it. Although it can easily be removed, washed, and put back in, you must keep track of how long the unit has been operating. You will also need to remove and empty the water tank more frequently on the Danby unit, not only because of the smaller tank size, but also because it removes moisture more quickly than other units. You can either opt for removing it manually or through its continuous gravity draining operation. Also, when it comes to time adjustability, Danby limits its setting to one hour increments through 24 hours and this could be a problem to some consumers who need a more specific timer. The electronic controls are easy to read and program and the appliance can run in temperatures as low as 5ºC. The Danby’s manual is clear, concise and easy to follow. The Danby features a grille that has massive gaps in order to allow more air to be pulled onto the unit’s evaporator coils more quickly. This unit is very convenient to move from room to room due to the 4 built-in rolling castors, but when it comes to carrying it, it weighs 43.4 lb., which is quite heavy. 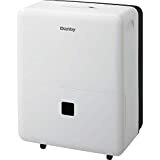 Although it is a greatly recommended dehumidifier, Danby is one of the more expensive 70 pint dehumidifiers on the market, its price ranging from 240$ to 260$. The Danby DDR70A2GP is incredibly easy to use and maintain, and once you get a hold of the times you’ll also be able to strike the right balance between the relative humidity level and power consumption. This is easy to use and is an eco-friendly dehumidifier with a very limited carbon impact. Dimensions Overall Height - Top to Bottom: -23.57 Inches. Overall Width - Side to Side: -15.25 Inches. Overall Depth - Front to Back: -12.19 Inches. Most rapid moisture removal in size class, most accurate hygrometer in size class. 2 year warranty (vs industry standard 1 year). High quality control panel and LED displays, and separate LED temperature display. This is Danby's newest 70 pint energy star dehumidifier. Casing is white. It has a two year warranty, auto de-icer for low temperature operation and is designed for large areas (spec'd for 3,600 sq. ft.). I bought this to replace my 70 pint Frigidaire dehumidifier that failed shortly after the one year warranty expired. The Danby comes with a five foot hose for continuous drain operation but I remove the water manually from the bucket. The water bucket is a little more difficult to remove from the dehumidifier than the Frigidaire. I'm very pleased with the Danby DDR70A2GP 70 Pint Dehumidifier purchase and it works great in my large finished basement." This model has worked in my finished 2400sq ft. basement flawlessly. I can sleep at night without worrying about its status. A very quality unit that I would recommend to anyone. I had a new Frigidaire FAD704DUD 70 Pt. Dehumidifier that I returned because it constantly malfunctioned and the customer service was very weak." This dehumidifier is a winner in many ways and it’s not hard to see why. All in all this is an excellent one-time investment that any buyer will not regret. Dehumidifiers play an essential role in regulating humidity levels in our homes and despite the bewildering array of choices out there, you can take comfort in the fact that you would not go wrong with this. If quick moisture removal is a priority for you then the Danby is an excellent choice, but if you need a quiet dehumidifier for a mild humidity problem or if you operate the unit in a room where you are most likely to spend a lot of time, then the Danby model is not the best option ! As always, our advice: think context and think long term when buying a dehumidifier!